Lulu started her American Tribal Style® belly dance journey in 2005 by dancing to a bootleg video of the original FatChanceBellyDance® Vol. 1 series. Blown away by the strength, beauty, elegance and poise of the dancers, she started looking more into what it was about, and soon placed an order for the Vols. 1 and 4 instructional DVDs. Without local ATS® instruction, she attended area workshops and private lessons with Carolena Nericcio (creator of ATS® and founder of FatChanceBellyDance®) and other FCBD® teachers where she continued studying and learning with the hopes of someday having others with whom to share in this amazing and empowering dance form. In addition, she started taking classes and performing with a local fusion troupe, the Sultana Dancers, where she eventually became a member/co-director. Through area workshops she explored Tribal Fusion, Egyptian/American Cabaret, Turkish Rom and various folkloric styles. Each expedition into another style brought her back to wanting nothing more than to dance FCBD ATS® in its original form. This led her to pursue and obtain the FCBD® General Skills Intensive certificate in 2008, and in 2013 complete Teacher Training to establish her FCBD® Sister Studio status. Wanting a well-rounded background in the genre, she has earned certification in Rachel Brice’s 8 Elements weeklong intensives Phase I – Initiation and Phase II – Cultivation. 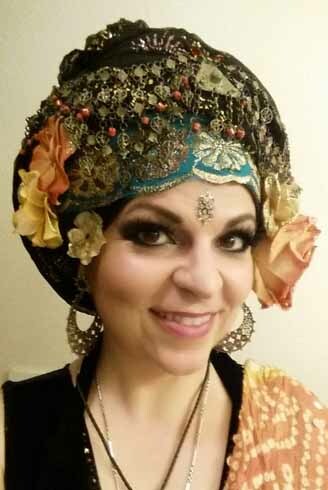 She was sent to Ukraine on a work assignment from 2010-2013, where she traveled to belly dance events throughout Europe, experiencing magic with dancers who shared different spoken languages, but were able to connect and clearly communicate through the language of ATS®! It really works! She was able to further her dance education while meeting the most friendly and kind (and talented) dancers, performing and occasionally teaching specialty workshops and at festivals in the UK (Mira Betz Gala), Spain (Umrah), Hungary (Tribal Fest Budapest), Israel (Oriental Pearl) and Ukraine (Tribal Weekend and Tribal Spring). She taught weekly classes in the FCBD® format to a group of fabulous Ukrainian women until 2013, when her work assignment came to an end and she returned home to the Tri-Cities, WA area. Since returning, she is grateful to have established a budding ATS® community in Southeastern Washington State, and is currently the director of Blue Amber Belly Dance in the Tri-Cities. She and BABD have performed throughout the Pacific Northwest, as well as Colorado and San Francisco as part of festivals, art shows and collectives with other ATS® dancers. Committed to providing the highest quality ATS® experience to students, as well as being an eternal student herself, she has taken annual trips to San Francisco to study with the source at the FCBD® Studio. In 2015 she graduated with the inaugural class of 10 from the two-week Advanced Teacher Training program studying with Carolena and Megha at the FCBD® Studio in San Francisco.